Four words. Fruit and Vegetable Chias. 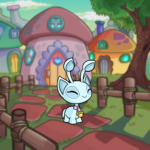 Anyone who's been around Neopia as much as I have, has seen these cute little Neopets at one time or another. Unlike other Neopets, Chias do not simply become a "painted pet" when dipped, zapped, or fed their magical Chia pops. They are completely morphed into a fruit or vegetable, with a new shape, size and color. With Chia Day upon us again, I have decided to travel Neopia and interview a couple of these adorable pets. First on the list is my very own DrShamrock, the Pea Chia. Hi, Sham. How are you doing today? "Pretty good. I'm super thrilled about Chia day this year. I've had my eye on that new Blue Bike, and I think it would make a great prese…." Ehhem. Shammy, we're here to talk about being a Pea Chia. Not presents. "Oh, ok then. Well, being a Pea is pretty much awesome. I mean, being a Veg is great. We're kind of like elite, ya know? But being a Pea, it's like the best of the best. With the SuAP avatar, and everything, Peas are super important." I'm glad you love being Pea. I love having you as one. Speaking of the SuAP avatar, how do some of the other Peas feel about being moved around a lot because of it? "Well, some of my best friends are avatar pets. When we're hanging out on Roo Island, gaming and stuff, we talk about it. Some are proud to give out avatars, but others hope to be Boochied. All in all, I think Peas have it better than other avatar pets. I mean, at least they get to stay like two weeks instead of a day. Mostly, I'm just glad you don't lend me out. Now about that bike…"
Sham! You'll just have to wait until Chia Day to see about that new bike. Thank you for the talking to me and I'd wake up early on the 18th if I were you. For our second interview, I traveled to the far away land of Shenkuu. There a met a sweet little Aubergine Chia named Faramae and her owner Rune (octopies). Good morning, Faramae and Rune. Thank you for letting me interview you today. "Oh, you're very welcome. We've been excited thinking about being in the Neopian Times!" Well, it's an honor to have you. My first question to Faramea is, how did you feel when you first became an Aubergine Chia? "When I first became an Aubergine Chia? That's an interesting question. I can't really remember, but I'm sure I was quite pleased. I mean, who has the chance to look edible every day? " That's very true. Speaking of looking edible, does it upset you that a lot of customization items are incompatible with fruit Chias? "I'm not really a clothes sort of pet, so I don't mind the fact that we don't have many customization items we can use. Rune normally manages to find the perfect background and foreground for me when she has enough NP on hand, and that's what I'm happy with to be honest with you." What a wonderful outlook. Rune must be very proud of having such an optimistic little Chia. Before I go, is there anything else you'd like the readers to know about being an edible Chia? "I think people should know that being an edible Chia is hard work. We're always in danger of being eaten by other members of our families, so we have to be able to run quickly. Or maybe that's just my family. All joking aside, I'd just like to say that Chias are one of the most cheerful pets in the world and owning one will bring sunshine to your life." Thank you, Rune and Faramae. Have a happy Chia Day! For my third interview, I climbed all the way to the top of Terror Mountain to meet with the Lenny who runs the Super Happy Icy Fun Snow Shop. This shop is the only place in all of Neopia where Magical Chias Pops can be purchased. Unfortunately, as soon as I entered the shop, I was immediately shooed back out. All the while, the shopkeeper was screeching something about the Hot Hot Purple Flame Shirt I was wearing. To avoid wasting the trip, I found a few Snowy Valley locals and asked them about the pops. A little Christmas Chia had this to say. "Magical pops are pretty rare. My owner and I spend every Half-price Day at the Snow Shop, and I've only ever seen one. The line of Chias is always out the door long because everyone wants to get one. I'm still keeping my fingers crossed that my owners gets an Asparagus Pop." While out on my travels, I also stopped by the Neoboards. First on my list was the Avatar Chat. There I was told that Pineapple Chias are "awesome-sauce", and Chokato owners were "stoked" and "uber-happy" to finally have their dream pets. The Pound Chat found that fruit and vegetable Chias "traded pretty well", and the NC Mall Chat was mostly indifferent. Overall, having 22 different types of fruit and vegetable Chias throughout Neopia (including a few of my favorites: carrot, plum and pea) means there is something for everyone. So, take some time this Chia Day to think over adding some fruitiness to your family. I'll leave you here with a few quotes I collected, and be on the lookout for my next article "More Like Lack of Meepits". But remember, Don't eat the veggies!